The moment a child figures out how to pick up a crayon, she begins an adventure through art from scribbling to realistic creations. Just like with learning how to read or write, children go through levels of development in art – and it is a fun and educational journey. And, with summer right around the corner, there are lots of exciting ways to keep those little hands busy – and out of trouble! Viktor Lowenfeld, an art education professor at Pennsylvania State University, published Creative and Mental Growth in 1947, detailing the development of art in children. His writing teaches the Stages of Artistic Development, which ties together the intellectual, emotional, and aesthetic growth of art in children. According to Lowenfeld, the first stage of a child’s art development is the scribble stage. Youngsters, from birth to the age of four, explore their abilities to make marks using various materials, including that pen you left out on your home’s walls. Lowenfeld breaks the scribble stage into four sub-stages titled the disordered, longitudinal, circular, and naming. During the disordered sub-stage, a child creates light or dark scribbles with little or no control over her motor skills. Longitudinal scribbles show the beginnings of controlled repeated motions and understanding of movement. During the circular sub-stage, a child further explores her control over mark-making implements. In the naming stage, she begins to tell stories about her scribbles along with naming them, even though they are non-representational. Marvin Bartel, a retired professor of art at Goshen College, finds the scribble stage to be about how things sound and feel, along with the pure joy created for children when drawing. Bartel calls scribbling a child’s “job” which, “grows out of their innate learning instincts.” This means those unsuspecting walls are at risk of being covered with scribbles, as a child does not understand, that the family’s walls are not for her mark making. Bartel suggests placing pads of paper on easels, or directly on walls, for a child to comfortably, and wall harming-free, create scribbles when she so feels inclined. The early desire to scribble enforces Lowenfeld’s thoughts that a child’s brain is developing and learning from their first artistic creations. Dr. Susan Sheridan finds scribbling to be “ an artifact of the evolutionary connections between speech and literacy.” These simple marks are a way for the brain to synchronize activity in the multiple layers of the brain tissue for language processing and problem solving. When a child is concentrating on her mark making, she is training her brain to be attentive, encouraging her brain to visualize shapes and forms, and organizing patterns of thought. The scribble stage may seem to continue for years. But, this stage eventually turns into the preschematic stage. Those looping round circles will become somewhat representational potato-head bodies with small protruding lines for arms and legs. While a child is so fanatic about scribbling, do engaging art activities that show interest in her artistic expression, along with creating some wall-worthy art, even if it is a bunch of scribbles. -During the scribbling stage, a child is experimenting with grasping, holding, and pressing objects, which develops the small muscles of her hands. Use masking tape to create an artwork that boosts fine-motor skills and expressive line making. -Offer the child small strips of masking tape and encourage her to press them onto a white piece of paper. This encourages her hand to grasp and press the tape. -Once she’s positioned the tape and ready to move on, give her a selection of crayons and have her cover the entire paper. While she is coloring, test her color recognition skills by holding a crayon and asking her what color it is. -When the child’s finished, have her remove the lengths of tape and discover what lies underneath. -Allow a child to scribble using washable markers on a piece of white paper, inviting her to use the markers on the paper and not in her mouth. -Although it looks like a lot of scribbles, ask the child about her creation. Susan Lemons, Child Development specialist, reminds parents that the scribble stage “isn’t about the product, but the process.” Encourage her to make big looping scribbles and small round scribbles, motivating her to explore the way she can create marks. -Give prompts, when necessary, about holding a mark making implement or how to use it properly, such as reminding her that markers belonging on the paper. This benefits her understanding of different art materials. -When she is ready, remove the markers and provide her with a wet paintbrush, showing her how to paint over her scribbles. Re-wet the paintbrush as needed as she continues to cover her marks. -Separate a prepared batch of vanilla pudding into small cups, adding drops of food coloring to create a selection of colors. -Touch is one of the five senses and doing art activities that allow a child to explore how things feel benefits her early sensory development. The five senses are how a young child learns about the world around her. -Place spoonfuls of the pudding finger paint onto a white paper and invite the child to use her fingers as line making tools, and enjoy tasting them while she works. -Along with exploring her sense of touch, assist the child’s understanding of her sense of taste. 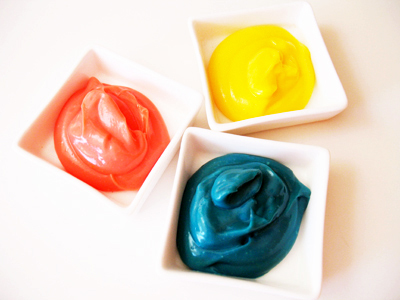 Do a taste test with the pudding finger paint, asking the child if the different colors of finger paint taste similar or different. Ask her about words she feels describe the taste of the pudding. No matter the activity, allowing children to explore their budding creativity during the Scribble stage encourages brain development and builds self-esteem. Spend time creating with children – you might find yourself enjoying some scribbling, too!